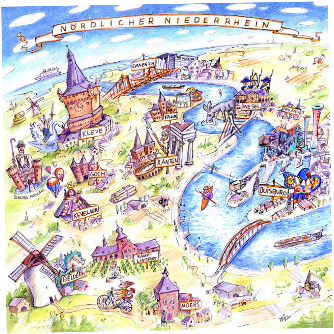 The Lower Rhine region or Niederrhein is a region around the Lower Rhine section of the river Rhine in North Rhine-Westphalia, Germany. 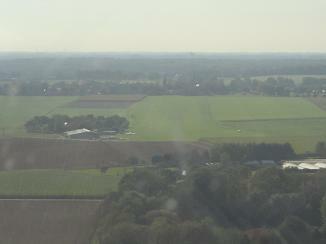 The Lower Rhine region's landscape is mostly flat green grass land with wide views of the horizon. 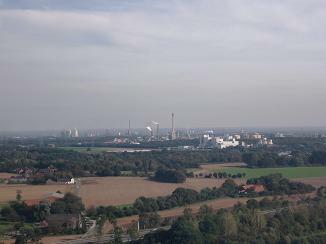 Sights include the historic town centers of Cleves and Xanten, as well as the latter town's Roman archeological museum, the castle "Schloss Moyland" in Bedburg-Hau or the Catholic pilgrimage town of Kevelaer. 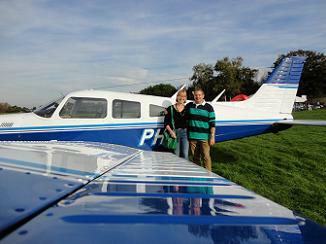 On Sunday afternoon, 28 September 2014, Veleda and René made a flying trip from Lelystad to the Niederrhein region, visiting the airfields of Krefeld, Kamp Lintfort and Wesel. 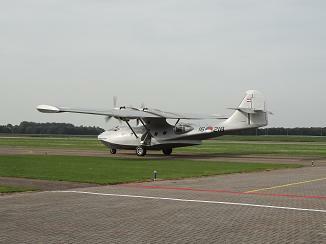 Since 1912 several areas were used by pilots for their early test flights near Krefeld. 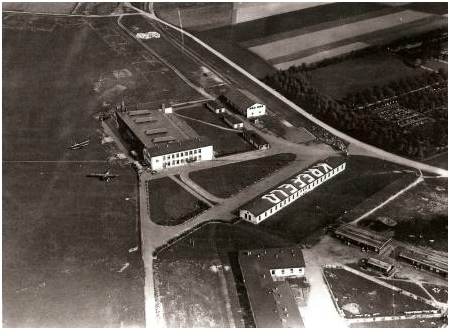 The airfield Krefeld-Bockum was built from 1916 to 1918. 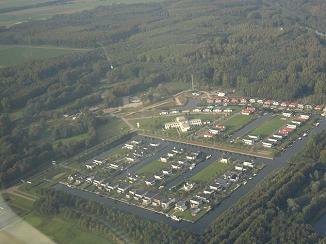 After World War I the airfield was occupied by Belgian and French military forces. 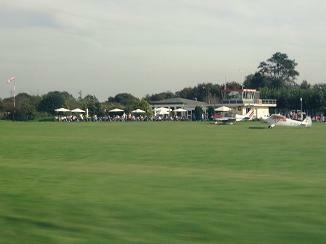 After the occupying forces left, the airfield in Bockum was reopened in 1926 with regular services by Lufthansa. 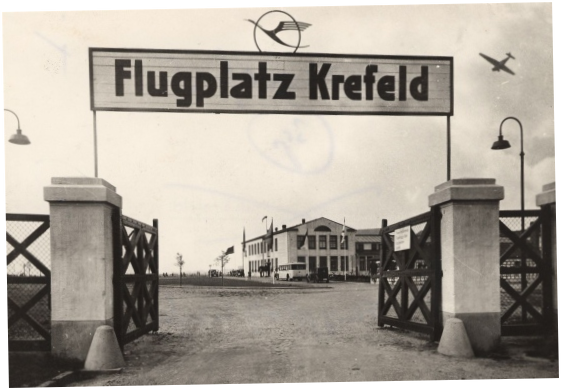 During World War II Krefeld became a Luftwaffe Fliegerhorst. 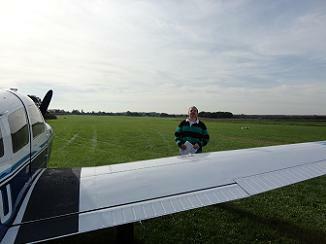 Following World War II, the British occupation found the airfield of little use. 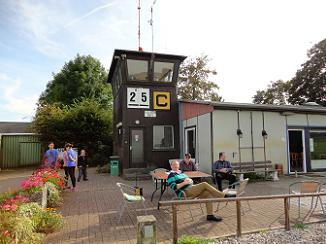 In 1947 a request was made with the Allied military to release the terrain for civilian use, and in 1950 the former airfield was released to the city of Krefeld. Shortage of housing in the by bombing raids ravaged city of Krefeld was immense. Nearly three-quarters of all homes were damaged or destroyed. 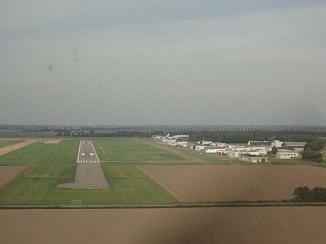 The airfield was ultimately completely built over by Krefeld Gartenstadt. 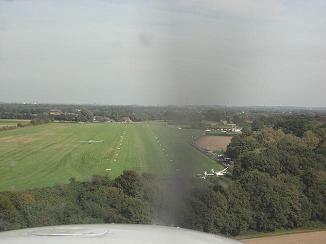 In 1950, the Krefeld Aero Club was founded and in 1952 the first glider starts commenced at Egelsberg in the district Traar. 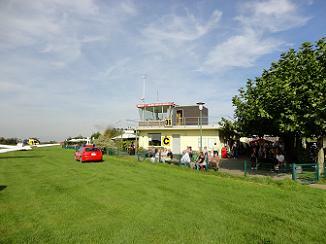 The Airfield Community Krefeld-Egelsberg was founded in 1954 and became the operator of the airfield. 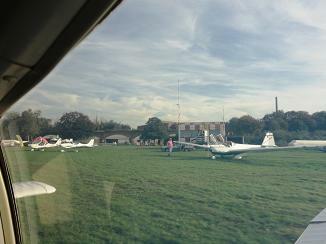 Along the parking area at Wesel airfield there is a railroad stemming from the 19th century. 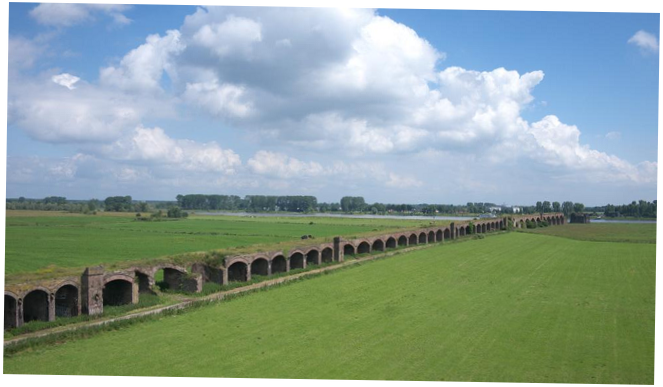 In the period 1872-1874 a railway bridge was construced over the river Rhine near Wesel. 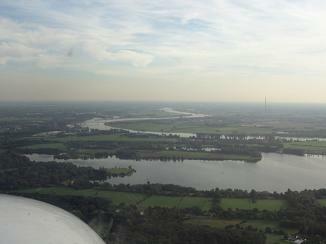 At the time it was the northernmost bridge over the Rhine in Germany. 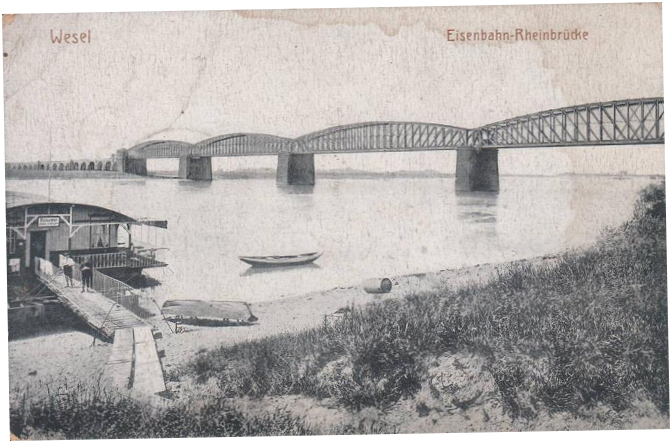 With its 1,950 meters in length, it was the longest bridge across the Rhine and until 1913, the longest bridge in Germany. 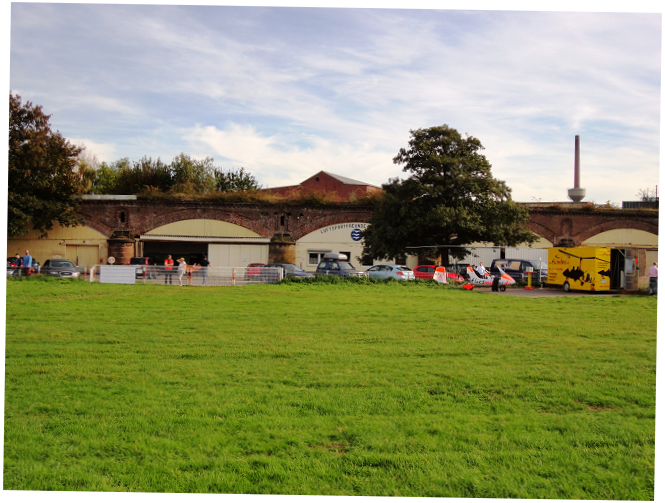 From 1917 an additional road bridge existed in the immediate vicinity of the railway bridge. 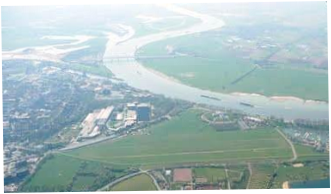 The reason for the bridging of the lower Rhine in Wesel was the construction of the Hamburg-Venlo railway. After the line Wesel-holders was opened on 1 March 1874, the first train from Wesel to Venlo ran on New Year's Eve 1874. 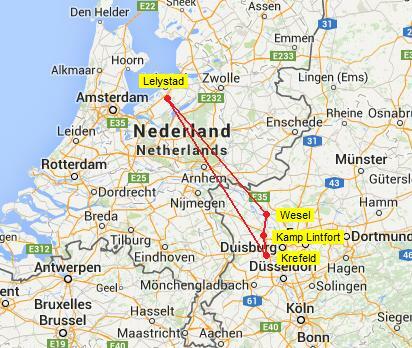 In 1878 the North Brabant-German Railways (so-called Boxteler railway) opened its line from Goch to Wesel. In the years 1926-1927 the bridge on the old river piers was renewed to enhance the openings for the shipping. 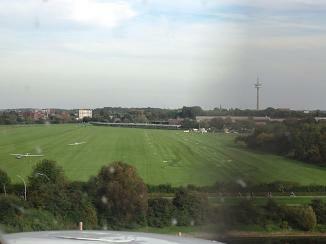 The arches over the Rhine were replaced by a new steel structure. 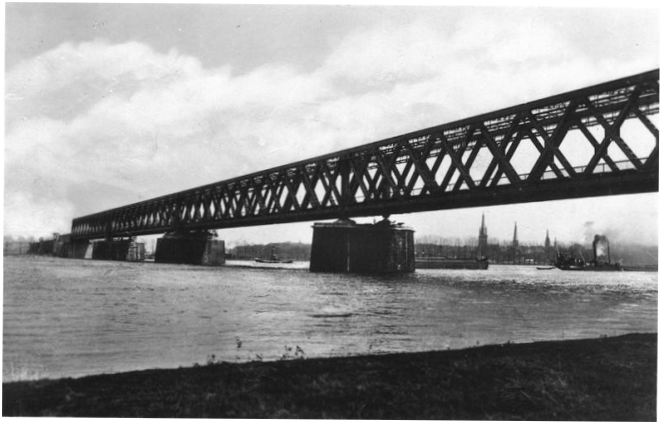 On 10 March 1945 the bridge was blown up by the retreating Wehrmacht. It was the last Rhine bridge remaining in German hands. 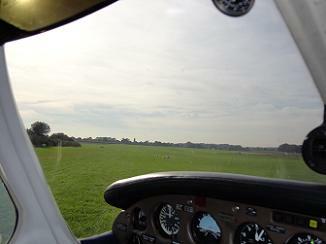 Today the ruines and remains from the railway can still be seen south of Wesel airfield. 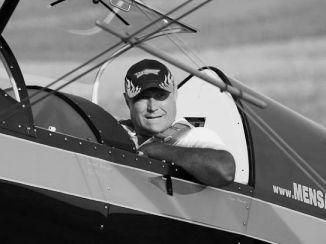 On this day aviator Filippo Roncucci with a Russian female passenger got killed in a crash near Mensanello airfield (Italy) during aerobatic maneuvers in his Pitts Model 12. We did not learn about the tragedy until much later. We were shocked. 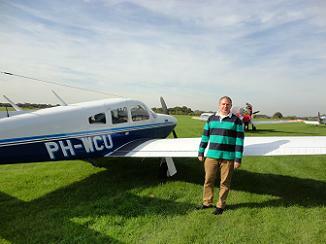 We have visited Mensanello a number of times, the first time in 2008 while Filippo was still building his Pitts. Filippo was a warm person, and we have very good memories of him. We will miss you, Filippo.